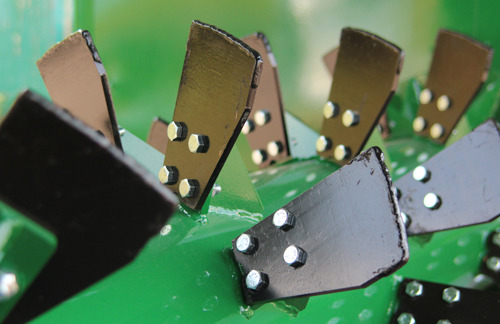 How Important are Compost Turner Tines to Making Quality Compost? If the bristles on your toothbrush are worn and bent, how successfully will they create clean, white teeth? If the tines on your compost turner are worn and bent, how successfully will they remove the bad stuff in a compost windrow, namely CO2. Since we all know a good toothbrush promotes good oral health, similarly, good turner tines, promote good, high quality compost. Tines get the bad stuff out! It’s critical for the health of the windrow that you practice good CO2 management, replacing the carbon dioxide that builds up there with oxygen. This is accomplished by the design, placement, and durability of the tines mounted on the turner drum. CO2 is a waste product of those billions of little microbial critters in the pile breaking down organic matter. The gaseous exchange which takes place during a pass of the compost turner should result in 4% or less of CO2 in the windrow right after it is turned. This can be measured with a CO2 kit.